For people of color who live in segregated urban neighborhoods, surviving crime and violence is a generational reality. As violence in cities like New York and Los Angeles has fallen in recent years, in many Chicago communities, it has continued at alarming rates. Meanwhile, residents of these same communities have endured decades of some of the highest rates of arrest, incarceration, and police abuse in the nation. The War on Neighborhoods argues that these trends are connected. Crime in Chicago, as in many other US cities, has been fueled by a broken approach to public safety in disadvantaged neighborhoods. For nearly forty years, public leaders have attempted to create peace through punishment, misinvesting billions of dollars toward the suppression of crime, largely into a small subset of neighborhoods on the city’s West and South Sides. Meanwhile, these neighborhoods have struggled to sustain investments into basic needs such as jobs, housing, education, and mental healthcare. When the main investment in a community is policing and incarceration, rather than human and community development, that amounts to a “war on neighborhoods,” which ultimately furthers poverty and disadvantage. Longtime Chicago scholars Ryan Lugalia-Hollon and Daniel Cooper tell the story of one of those communities, a neighborhood on Chicago’s West Side that is emblematic of many majority-black neighborhoods in US cities. Sharing both rigorous data and powerful stories, the authors explain why punishment will never create peace and why we must rethink the ways that public dollars are invested into making places safe. The War on Neighborhoods makes the case for a revolutionary reformation of our public-safety model that focuses on shoring up neighborhood institutions and addressing the effects of trauma and poverty. 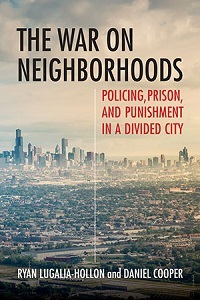 The authors call for a profound transformation in how we think about investing in urban communities—away from the perverse misinvestment of policing and incarceration and toward a model that invests in human and community development.